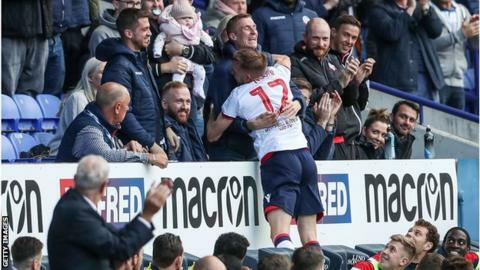 Bolton's Craig Noone honoured recently retired team-mate Stephen Darby by celebrating his first-half winner against Derby County in the stands with the defender. Noone beat goalkeeper Scott Carson with an early header across goal before racing to Darby, who was forced to hang up his boots earlier this month after being diagnosed with motor neurone disease. Frank Lampard's Derby, who four days earlier knocked Manchester United out of the League Cup, went on to control much of the possession but had to wait until the 88th minute to get a shot on goal. Goalkeeper Remi Matthews ensured Bolton earned their first win in six games, denying Mason Mount from close range. In the first game since Darby's enforced retirement, Trotters players paid tribute to their team-mate before kick-off by each walking onto the pitch wearing shirts with the defender's name and number 23 on the back. And after Noone met Will Buckley's cross to put them ahead with a fine finish at the far post, the winger ensured the occasion was marked with an emotional celebration. Both sides had chances after the break, with Carson doing well to keep the Rams in it with a fine low save from Will Buckley before Matthews was finally tested late on by Mount. Bolton's first league win over Derby in 10 attempts moved them up to 14th in the Championship table and to within a point of the Rams in ninth spot. "It was an outstanding display against an outstanding team. "I have been to watch Derby a couple of times over the last four weeks and I think Frank's got a fine balance of experience and youth. "We knew they had some extremely gifted players and we knew we'd have to be at our best and I think we probably were." "We did not show enough creativity. We weren't at it with our passing and we weren't crisp enough to get into the area we normally get into. "When you concede early against a team that will defend well as they did it makes the afternoon difficult. "We have come back in games a few times this season, but you can't keep doing that. "The beauty of the Championship is you do move on quickly, but I am a bit fed up saying that. If we want to be as successful as we want to be we cannot go win some then lose some. We have to get some consistency. That's up to the players." Match ends, Bolton Wanderers 1, Derby County 0. Second Half ends, Bolton Wanderers 1, Derby County 0. Corner, Derby County. Conceded by Jonathan Grounds. Attempt blocked. Tom Lawrence (Derby County) right footed shot from outside the box is blocked. Assisted by Martyn Waghorn. Attempt missed. Mason Mount (Derby County) left footed shot from outside the box is high and wide to the left. Assisted by Richard Keogh. Attempt saved. Mason Mount (Derby County) right footed shot from the centre of the box is saved in the centre of the goal. Assisted by Craig Forsyth. Foul by Jack Hobbs (Bolton Wanderers). Substitution, Bolton Wanderers. Josh Vela replaces Erhun Oztumer. Attempt missed. Craig Bryson (Derby County) left footed shot from outside the box is high and wide to the left. Foul by Erhun Oztumer (Bolton Wanderers). Corner, Derby County. Conceded by Pawel Olkowski. Substitution, Derby County. Martyn Waghorn replaces Harry Wilson. Attempt missed. Joe Williams (Bolton Wanderers) right footed shot from outside the box is high and wide to the right. Substitution, Bolton Wanderers. Gary O'Neil replaces Craig Noone. Attempt missed. Jason Lowe (Bolton Wanderers) right footed shot from outside the box is too high. Offside, Bolton Wanderers. Jack Hobbs tries a through ball, but Erhun Oztumer is caught offside. Attempt blocked. Mason Mount (Derby County) left footed shot from the left side of the box is blocked. Assisted by Harry Wilson. Attempt saved. William Buckley (Bolton Wanderers) right footed shot from the left side of the box is saved in the bottom right corner. Attempt missed. Craig Noone (Bolton Wanderers) left footed shot from the right side of the box is close, but misses to the left. Assisted by Jonathan Grounds following a set piece situation. William Buckley (Bolton Wanderers) wins a free kick on the left wing.